Home/Blogging /What does your technology free downtime look like? The gears turned and it started a chain reaction which would ultimately lead to my demise. There’s always a chance it won’t. Something could misfire, the boot might miss the bucket or the blue pole with the hand might go awry, causing the metal ball to not drop into the tub. This time I knew my fate was sealed when the green man, who had been patiently waiting with his knees bent and hands held palm to palm, shot into the air and landed in the yellow bucket. My head dropped into my hands as I heard the red basket spiral down its spiked yellow stick. I was driving home from work the other day and was forced to sit in my usual cornucopia of traffic, accidents, and rain. I got to thinking this time about technology and social media and how those things have absorbed me. I’m either blogging about it, at work or home doing it, stopped at a red light doing it; I’ve constantly got my nose shoved in front of some device. I thought about my typical day – I wake up, check Facebook, Twitter and my blog, drive to work while checking Facebook at a red light (I am parked I swear it! ), get to work and spend my day working in front of a computer, drive home and witness TweetDeck crash on my phone again while parked at a red light, get home and fire up my Chromebook and check stuff, play Angry Birds on my phone, go on my main desktop PC and review things, and just before I fall asleep I lay in bed and read a book on my Kindle. Holy smokes what are we doing to ourselves? Does this describe your typical day too? What is real anymore? Technology was designed to make our lives easier but what part of our lives is it taking away? What I try to do is have disconnected downtime. How I accomplish that is through my kids. We play board games, we go for walks, we geocache (which is cheating about disconnecting slightly), we hit the playground, and make memories without the benefit of technology. That’s the real stuff. Memories. Staring at the computer and updating a status doesn’t build the kind of memories that will live forever inside of you. After a few weeks, you’ll forget all about it. Seeing your son find that geocache buried under a bench or watching your daughter demonstrate how to crush her opponents in her favorite game? That stuff is priceless. 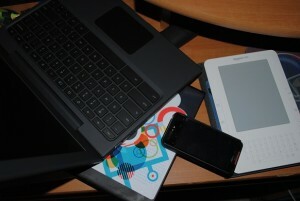 So I ask you … “What do you do on your “technology free” downtime?” You do take some don’t you? You do go out there and build real memories right? People at work sometimes ask to borrow the company laptop when they go on vacation. I always give them a hard time and even laugh some. A vacation is not only time away from your real life but technology as well. That stuff will be there when you get back. Go build some memories and then come back and share them. 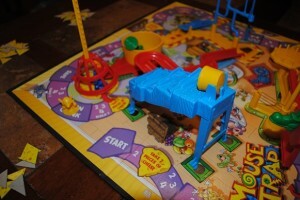 The game was Mouse Trap and the stakes? They were high. After eliminating me from the game, my daughter went on to win by defeating her brother in a bitter struggle for power around the cheese wheel. We played again. I lost again. Later my son proceeded to hustle me in Monopoly Junior. After that my daughter flipped her last card in the princess slipper game to win. Just before bed, revenge was finally mine as I crushed both of them in Mickey Mouse Yahtzee. We laughed, one of them spent a minute in time out but we created some pretty cool memories. The best part? It was real and no technology was required. Thanks to Flickr for the pic!